Everyone only has one pep band left! If you missed your first pep band and did not find a sub it will impact your grade. Be sure to attend your last one in the next three weeks! 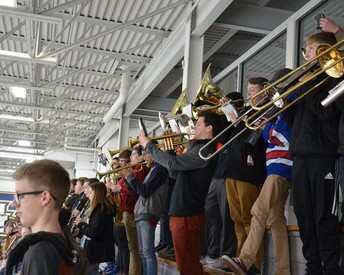 Students can attend more than their scheduled pep bands, for each additional pep band attended students will receive 25 points towards their Varsity letter. Attendance is taken at every game at the beginning and between the 2nd and 3rd period. 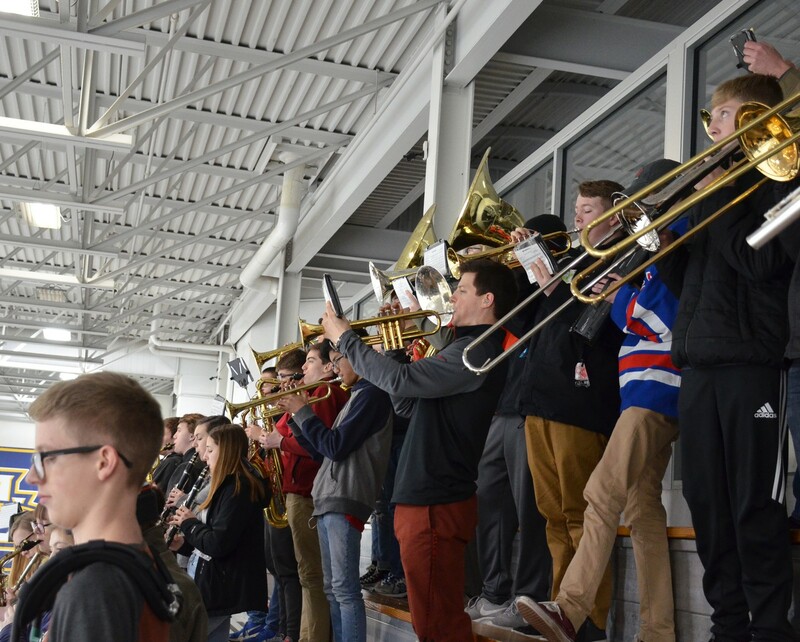 You must be seated with the band and stay through the end of the 2nd period to receive credit for the performance. All of our Band students are required to participate in a large ensemble for Solo and Ensemble. Please make sure this date is on your calendar. We are able to accommodate schedule requests due to conflicts. Please make sure that conflicts are communicated earlier rather than later. Our annual Solo and Ensemble Festival is rapidly approaching. We are incredibly grateful for the Red Raider Band Boosters that support us bringing in multiple coaches to help prepare our students for this performance. The Band Boosters also cover all registration and medal costs for all of our large ensembles, so that our students can participate in Solo and Ensemble at no cost to you. Students in Jazz I, II and III will also participate in Solo and Ensemble. Students are also welcome to perform solos, duets, trios and quartets. A complete listing of WSMA events can be viewed by clicking the link below. Students are encouraged but not required to perform additional events. Students performing an event that is separate from their large ensemble must complete the google form below. There are also additional fees associated with these events. If your student is not listed above and is planning on participating in a solo, duet or trio they must submit the form linked above by Friday! Be sure to ask your student which ensemble they are in so you don't miss their performance. Interested in volunteering for Solo and Ensemble? 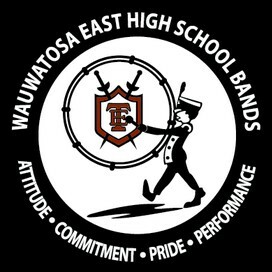 Thank you for your interest in volunteering your time to help the Wauwatosa Music Department facilitate our Solo and Ensemble Festival. Morning volunteers should plan on meeting in the Wauwatosa West Library at 7:30am. Afternoon volunteers should plan on meeting in the Wauwatosa West Library at Noon. If you are volunteering with us all day you only need to attend the morning meeting. Please note that if you are volunteering in the afternoon on Saturday, parking can be a challenge. Please plan some extra time to allow yourself to find a parking spot. We are looking forward to a successful Festival. Runners- Go around to all of the rooms were events are being held collecting forms to bring the office. Relief- Relieve workers that may need to use the restroom or watch their child perform. Hello! My name is Jennifer Erickson and I am the mother of Michael Erickson a Junior trumpet player in the band. Here is an update on where we are for the rummage sale. Join us for our next meeting: February 15th, 2018 at 7:00pm in the Lunch Room. If families want their items back they can be picked up by the family at 3:00 or volunteers will take all the items to Good Will or another recommended agency. Profits: profits will be split evenly by all participating families who work their shift and bring their items to sell. When we did this for orchestra as a fundraiser we had approximately 40 families participate and each family made approximately $140.00. I believe we could double the profit due to the greater number of families involved in this trip. Please email me (jenwright68@hotmail.com) if you are interested in being on any of the committees listed below. Advertising: Determines Where, How and Who will we get the word out re: the sale. What will we use to advertise: flyers, student created posters, etc. Who will create the flyers, what information should be on the flyers, where should the flyers be hung. What the band students could do to help get the word out. What social media can be used. How Tosa schools can get the word out, etc. A timeline of when advertising should begin and what can go on even the day of the sale to get people in the doors. Recruit any band parents who might have a company where colored flyers could be printed for free. 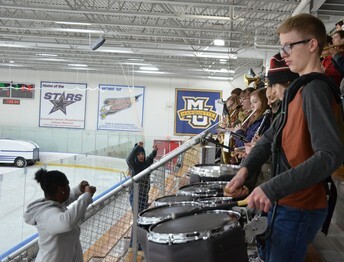 Our first Hockey Pep Band was a success! !